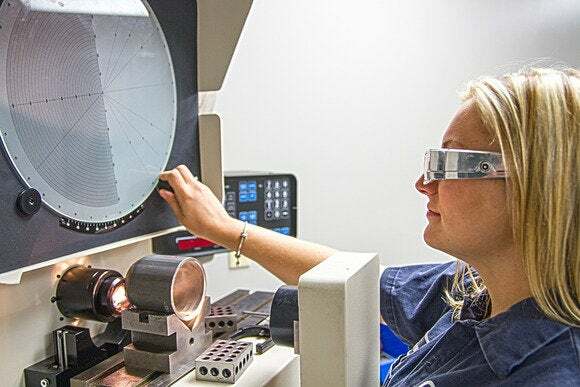 The future of smartglasses will be realized by a factory worker operating a 3000-pound stamp press, not a gamer stomping on virtual-reality bad guys. Face computers will be all about scanning bar codes on cardboard boxes, not scanning tourist attractions for augmented reality overlays. Dig it: Smartglasses are a productivity story. They’re about getting things done. This is the vision of XOEye Technologies, which this Friday will begin seeding its XOne smartglasses to some two-dozen companies in blue-collar business sectors ranging from overnight delivery to oil and gas. A factory worker operating heavy machinery could give her foreman a clear point-of-view video of everything she’s seeing. Here we see an early XOne hardware prototype. XOEye CEO Aaron Salow says smartglasses represent the next wave of business communication. Every 20 years, he posits, a new technological breakthrough fundamentally changes how workers communicate with each other and clients. In the 1950's, the enterprise space depended mostly on phones. Faxes made an impact in the 70's, and email changed everything in the 90's. 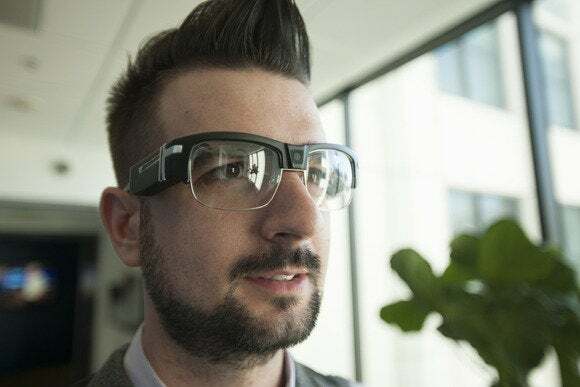 Next up: “activity streams.” Smartglasses like the XOne will share streams of data—audio, video and even rarefied sensor information—to connect workers with colleagues in unprecedented and liberating ways. Or so Salow says. The XOEeye concept is simple by design, and it needs to be if roughnecks on an oil rig or hardhats on a factory floor are going to bother with newfangled tech. An employee dons the XOne glasses, and everything he or she sees is streamed from an onboard 5-megapixel video camera to Vision, XOEye’s cloud platform. Tapping into Vision, remote colleagues can see everything the employee sees—and from the employee’s point of view. The XOne prototype has two user-changeable earpieces. One earpiece contains the glasses’ battery, while the other one houses sensors and core-logic. A 5-megapixel video camera sits smack-dab in the middle of the frames. The smartglasses also include two microphones and a set of earbuds, so employees at a job site can easily speak with coworkers, whether they’re located in a different part of the same building or 2000 miles away. 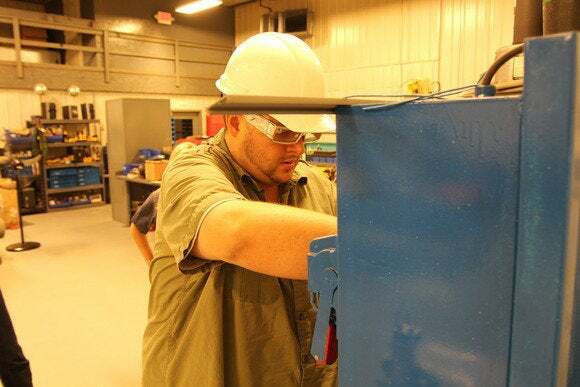 And because the XOne glasses include an accelerometer and gyroscope, XOEye’s Vision platform can log body movements, inviting new possibilities for managing worker safety and ergonomics. Aaron Salow, pictured here wearing the XOne smartglasses destined for the pilot program, says his company’s hardware is informed by years of experience in heavy-duty work environments. Because camera sensors can also read bar codes, the XOnes could be used by airlines that need to route thousands of pieces of luggage every hour. Currently, this is a grueling process that requires an employee to pull a heavy suitcase off a conveyor belt with one hand, while reading the luggage tag with a handheld scanner in the other hand. 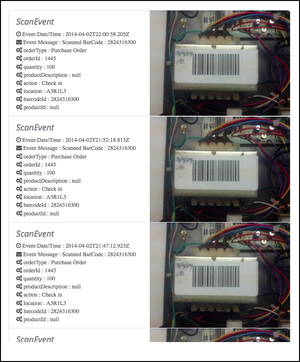 A series of “scan events” as captured by the Vision cloud platform. The XOne’s movement sensors could track how many times a factory worker bends down during a shift—or send an alert when an employee is entering a danger zone. Similarly, Salow says, the XOne’s accelerometer could trigger an alert every time a factory worker exceeds an acceptable forklift speed. Or perhaps a dangerous machine shuts down anytime someone wearing the smartglasses gets too close to a saw blade or stomp point. Salow says XOEye will provide customers with APIs so they can build and implement custom applications that interface with their own unique workflows. Using the back-end Vision cloud platform, an IT manager can control exactly which applications load onto exactly which XOnes in the field. So it all sounds very enterprisey. But what would Salow make of the “Glass at Work” announcement that Google issued on Tuesday? Salow thinks Glass is ill-suited for the industries XOEye is targeting. Specifically, Glass’ reliance on voice control and capacitive touch makes it a non-starter for noisy work environments where so many employees wear gloves. Another look at an early XOne prototype—this time in a telepresence scenario using high-precision machinery. Like Glass, the XOne's interface features voice control, but the glasses aren’t dependent upon it. The XOne doesn’t employ capacitive touch, and instead has two hardware control buttons for times when the din of machinery drowns out voice commands, and when heavy safety gloves make traditional touch control impossible. You’ll also notice that the XOne lacks any type of display to provide visual feedback for the system’s applications. That’s a design feature, an acknowledgement that excessive visual feedback isn’t necessarily safe, Salow says. Instead the XOne has a strip of LEDs that run along the interior of the frames and send simple messages back to the worker—for example, a green LED could indicate a package has been properly scanned. And of course, the clear lenses on the XOne are impact-resistant to ANSI Z87.1 standards. The glasses’ earbuds are safety-certified, too. Salow says subscription fees will likely drop if a business buys XOnes at scale. But will the costs be low enough to spark an “activity stream” revolution? 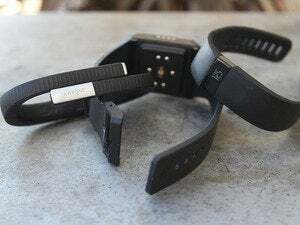 Well, if any use cases have the potential to spur wearables adoption, it’s the kind that put workplace productivity front-and-center, analysts say. Ironically, even though the XOnes aren’t designed for aesthetics, they do project a certain nerdy-cool Buddy Holly vibe. And, hey, it’s not like XOEye’s customers will have to worry about how they look in the XOnes. When you’re operating a 3000-pound stamp press, your main concern is precision, safety, and getting the hell home. Aesthetic concerns can wait until after you clock out.